Operate comes with a complete Sales module that you can use to manage your workspace sales: from leads, to opportunities and tours. The strictly sales related features of Operate are found in the Sales section of the main navigation menu. However, this module is interconnected with other Operate modules that allow you to continue managing the relationships that you have started via Leads and Opportunities. Your sales process continues with tools such as Accounts and Contacts; as well as with the Booking Calendar or Licences. - Via a converted "Unreadable Lead"
The next step is to validate whether or not you have received the enquiry previously you can do this using the "suspected duplicates" featurethis is important as the commision should go to the broker that introduces you to the prospect first. Once you have converted a lead and it has become an opportunity, you can overturn this Opportunity to a new broker using the overturn feature. Assuming your lead has no duplicates, and you have qualified and can meet the prospects requirements you can then convert your lead to an Opportunity. An opportunity is an accepted lead, with which you can continue discussing a deal, book viewings and create a licence if discussions progress. When you convert a lead you will be left with a converted lead and you will gain an Opportunity which is linked to an Account. 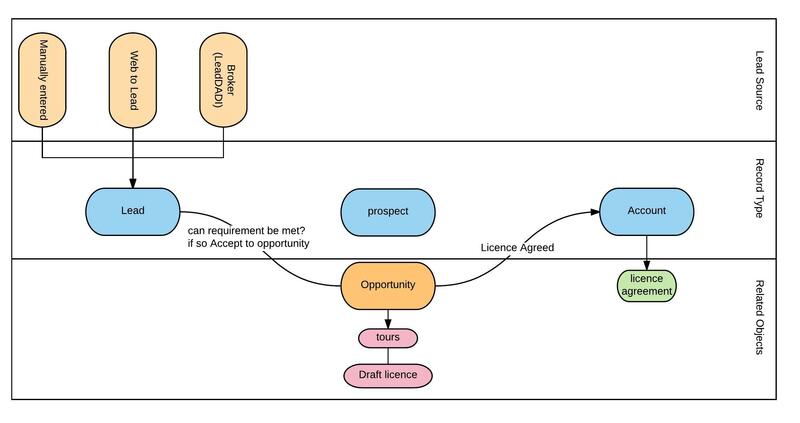 If you have already received the lead via another broker or you are unable to meet their requirement, at the lead stage you should "Dead/Reject" the enquiry. The next step is to provide tours and send them quotes using the email function - To nurture the relationship with your prospect, you can use Operate Opportunity records to schedule a tour with your prospect, share quotes and set yourself or others follow up tasks. Lastly, turn your opportunity into a customer by creating licences for long term rentals or or booking meeting rooms for a shorter amount of time. Features that allow you to easily create and update your records. Lead conversion features that let you turn your leads into account and opportunities. LeadDADI integration so you can automatically receive leads from LeadDADI brokers. Web to Lead features that allow you to sell your space through your website. Automatic replies to incoming enquiries so you can provide instant feedback. Lead auto-assignments to your staff members so that you can manage them more efficiently.